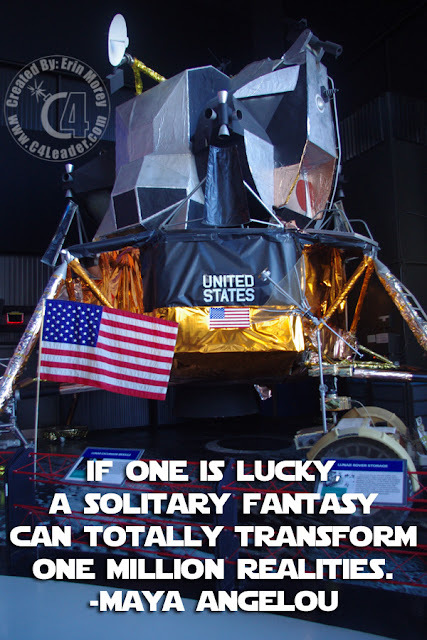 All of these things (arguably) exist because of a "solitary fantasy" of one man: John F. Kennedy. His challenge to send a man to the moon and return him safely to the earth inspired a nation for a decade, and the results are on display at the Space and Rocket Center. It transformed the realities of not millions, but billions of people when Neil Armstrong set his foot down on the powder of the moon's surface. If One Is Luck, A Solitary Fantasy Can Totally Transform One Million Realities. There are others who could fit this statement. Martin Luthor King Jr., Nelson Mandela, Mother Theresa are only a few names that come to mind. Each of the people identified are paragons of leadership and their names are recognized around the globe. That is a very high mark to set. For this week, I would ask you to look at yourself and the people you are leading. Do you have a vision/goal for the team and have you shared it? Before you can transform the realities of millions you need to be able to change the reality of one. Define your fantasy, and share it with your team. Then start working toward the plan of how you can make this fantasy a reality. If you cannot, then it will never become your reality, or inspire your team to transform their own. Maya Angelou is an American poet, singer, memoirist and civil rights activist. She has received dozens of awards and more than 50 honorary degrees. She recited On the Pulse of Morning at President Bill Clinton's inauguration in 1993. Her books are used in schools and universities worldwide (although there have been efforts made to ban them from some U.S. libraries).